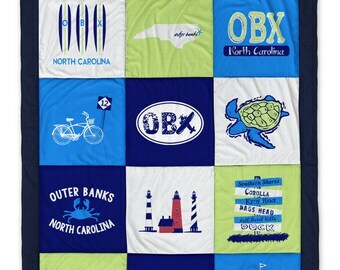 Announcement LIMITED TIME SALE - $139.95 for Hilton Head and Montauk Blankets! LIMITED TIME SALE - $139.95 for Hilton Head and Montauk Blankets! We are a father and daughter team who spent our summers on the island of Nantucket for the past 2 decades. One day we decided we wanted to take a piece of the island home with us so we could have a constant reminder all year long our our happy summer place. It was then that the idea of the blanket was born. We designed this blanket more thank just any old blanket; we designed it to tell a story of our favorite vacation place. All of our blankets are made with unique artwork specific to each location, and our goal is to truly encompass the vibe of the destination. Our hope is that when you use this blanket throughout the year, you are comforted in its warmth-- not only from the soft fabric, but from the fond vacation memories that come flooding back. With our blanket, coasters, and other items, you can do more than remember your vacation-- you can Bring Your Vacation Home! Steve is the owner and founder of Beachside Clothing Company. He and Julie work together to create and market custom blankets, coasters, hats, and other items that tell the story and depict memories of you favorite vacation destination. Heidi coordinates the sales and design of our Destination Blankets and Coasters.